“Yes he did, he has arrived”, she replied as she adjusted the folding of the sari and tried to keep all of it aligned and perfectly in shape. Though she was new to the art of wearing a sari, but tried to wear it perfectly the way it was taught to her by her mother in law. As she was done with it, she found him staring at her surprisingly. “What? What” He said bluntly, “are you sure, you are are going Puri in Sari? “Don’t worry, I am quite confident”, she said with a chuckled smile. “Are you sure?” he enquired. He smiled and went to the bed room and picked the nicely ironed pair of dress. Both got ready and looked at each other, their eyes admired each other's outfit and exchanged their favorite muted words with smile. It was a two hours drive to Puri from Bhubaneswar, the city to which they have sifted recently and made it their home. Though he was born and brought up in the city, but to her the city was new and offered a new culture to explore and admire. They both had met each other in Delhi, at a seminar, where he spoke passionately about the culture and heritage of Orissa. Both had equal interests away from present trends. And they got married…….like any other love story. The driver parked the car near the Mausi Ma Temple and both took a rickshaw till the traffic allowed on the grand road - Badadanda. And both of them walked toward the Grand Chariots, which stood as magnificent decoration inform of colourful presentation. “Is Nandighosh, isn’t it – of Lord Jagganath”, she uttered with pure devotion in her eyes. It was all beyond her imagination, she has never seen, something so magnificent and grand. Being an artist herself, she drank the beauty of the ambiance through her eyes. 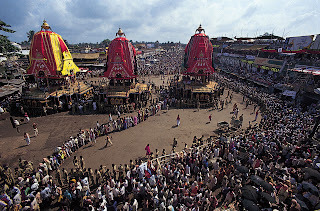 The pahandi began, first of Shudarsan, Then of Devi Subhdra followed by Lord Balbhadra. She Witness all of them with devotion and he was there near her explaining each and every thing to her with passion. 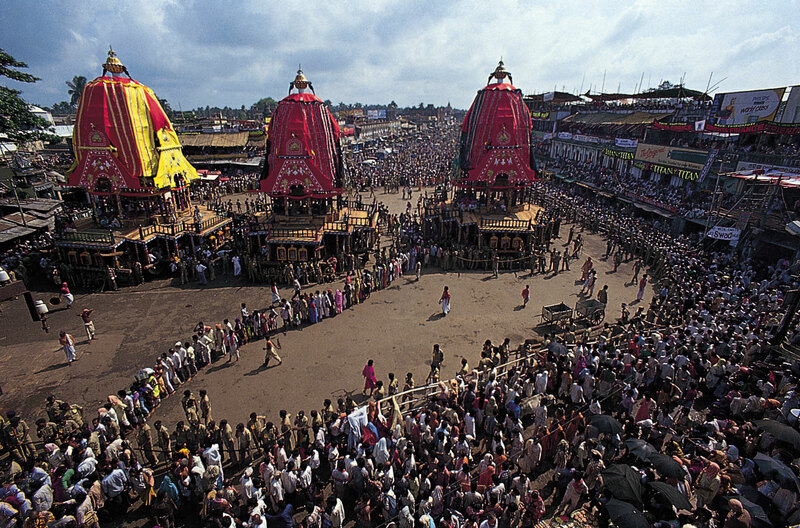 Then began the pahandi of Lord Jagannath; her heart leaped with joy, as she could get a glimpse of the famous round black eyes, which is so beautifully described poets and authors. And her husband, who stood beside her, had told everything about those round black eyes. The old carpenter and Queen Gundicha. Poems by the Muslim poet – Salabeg. The crowd began to surge, and it was difficult for the couple to stand on the space they have occupied and they decide to move to the vacant place ahead. He began to move faster and she tried to keep up the pace. But the sari she wore made it difficult to keep up the pace with him. Although he held her hand tight and advanced ahead, at times they have to part, when some came in between. As they move ahead they got momentarily separated from each other. In crowds like those, momentary separation is also dangerous. And thus both were was out of site. She thought he must have moved ahead so kept looking in the front and he thought she was left behind returned back again. And thus they widen the gap in between. He dialed to her mobile, which only rang and she didn’t picked. On the other side she wanted try the same and looked into her bag and to her fear she had found she had, forgot her phone. The only option left to both was to go near The Lost & Found PRO stall, and announce each other’s name. She rushed to one of it, while on other hand he kept on searching her in the crowd. As she approached one of the officials at the mic in the stall, she asked him to announce her husband’s name and tell him that she is looking for him. ‘Satyaprakash Nayak’ she replied eagerly. “And your name madam please”, the official asked again. “Yes madam what it is?” the official asked once again. “Its Aakifah Akhtar”, she said in a low voice. And he repeated it for many times. To the interest and curiosity of everyone around the stall, Aakifah stood as a prized display. A woman, who has got a Muslim name and is dressed like a beautiful odiya hindu woman, became a live example of cultures, civilizations and love for every religion. Hearing the announcement, Satya came running and struggling through the crowds. And both eyes met. Smiles were in there in their face and their eyes were moist. He took her hand in his and locked in-between his fingers. As they silently promised to never ever part from each other again, at a distance The Nandighosh Chariot paused for a moment, at the Salabega’s Tomb. A magnificen piece of work. Keep it up!